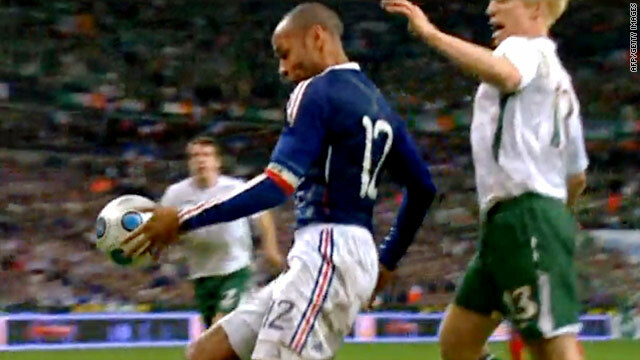 Henry's handball resulted in France's controversial winning goal against the Republic of Ireland in November. (CNN) -- World governing body FIFA have announced that France international striker Thierry Henry will not be punished for his handball in last November's World Cup qualification play-off against the Republic of Ireland. FIFA''s disciplinary committee concluded there was "no legal foundation" for them to deal with the case. The decision means Henry will not face a ban for any matches of this summer's World Cup finals. FIFA said in a statement: "The disciplinary committee reached the conclusion that there was no legal foundation for the committee to consider the case because handling the ball cannot be regarded as a serious infringement as stipulated in article 77a) of the FIFA disciplinary code. The Football Association of Ireland were infuriated by the goal and demanded a replay, even suggesting they should be allowed to go to the World Cup as a 33rd team.